Shoresh/The Ground is on Fire is a performance by the playwright and director Nasim Aghili and the visual artist and set designer Björn Karlsson, both international artists based in Stockholm, Sweden. The performance is inspired by four modern protests in Europe and USA and embodies historic and contemporary acts of civil disobedience, all of them important in the struggle for democracy and human rights. 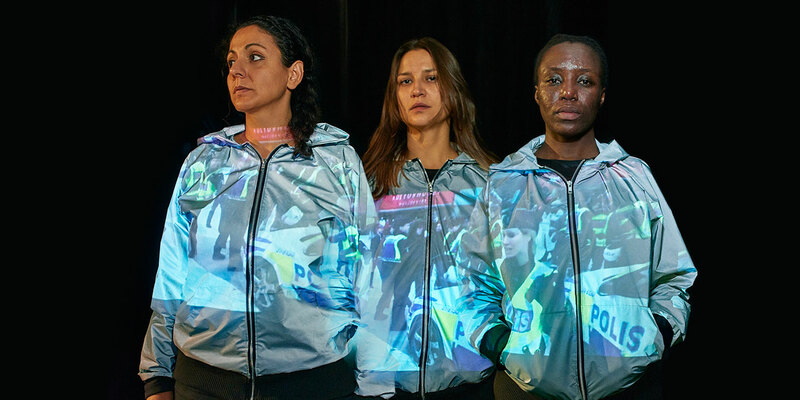 The piece is a follow-up to the Swedish performance ”The Ground is on Fire – a performance about uprising through Husby/Clichy-sous-Bois/Tottenham/South Central”, which in 2014 got massive attention and gave rise to one of the biggest debates around performing arts and politics in Sweden. The performance was supported by activists and artists but was cancelled after one month by the theatre Östgötateatern with two months of sold out performances left. The journalists and police debating the performance talked about reversed racism and questioned the critic of police brutality and the art piece’s right to envision other political orders. Shoresh/The Ground is on Fire has been performed in London, Paris, Los Angeles and Stockholm as the piece is an international collaboration between the Swedish art group aghili/karlsson and four poets from the four cities, performing on stage and creating a site specific performance. We believe that the different protest cities’ unique geographical context in relation to the themes civil disobedience and massive protests can create an artistic web of solidarity between the places, the protests and the artists bearing witness of the struggles for justice and human rights. aghili/karlsson (SE) is Nasim Aghili (director, writer and performer) and Björn Karlsson (visual artist, set design and costume). This artist duo works in the field of performing and visual arts. aghili/karlsson’s performances, theatre installations, art in the public space and soundpieces often deal with the experience of existing and living in different forms of exile mostly by creating grievability and healing rituals. Their latest performance piece Vahák, is a walk through a sound installation, a huge pink tent and poetic decolonising activism in different Sami languages and was one of the selected pieces at the Swedish Performing Arts Biennal for Children and Youth 2016. Nasim Aghili’s plays have been translated to different languages as English, Spanish and Arabic and their work have been performed in countries like England, Mexico, US, Holland, Estonia, Belgium, Norway and Sápmi.